The great thing about chicken is the amazingly large amount of things you can do with it. From preparation methods to different dishes, chicken is probably one of the most versatile of all of the meats. So here are a few ideas for how to cook chicken on the grill. When grilling chicken there is an amount of balancing involved: getting the meat cooked properly but not leaving it too dried out. Many people use rubs and glazes to help solve this problem while others opt for grilling them under a brick to stop them drying out or pounding them into thinner pieces to cook quicker. A rub is a mixture of herbs or spices that can add a savoury crust to the meat as either a dry mix or a wet one. Wet rubs use liquids such as vinegar, oil or even beer to combine the ingredients. Rubs are added just before grilling or with the wet versions, marinade in for a period before cooking. A glaze is more like a syrup using butter, oil or a sweetener like honey or sugar. Spirits can often be added to them such as bourbon or rum. Some people apply the glaze halfway through cooking to add extra flavour and to give the chicken a shiny finish. Brine is something more associated with fish traditionally but can be used with chicken for great results. A brine is a salt and water solution that keeps the meat moist and is typically one tbs salt with an option to add the same of sugar or sweetener for every cup of water. Other flavourings can be used such as herbs, garlic and spirits and usually time for brining is around 2-3 hours. Deciding how to cook chicken on a grill can be largely down to what type of dish you are producing. For example, if you want a simple grilled chicken, you can use a technique called paillard. This is a French term for taking a boneless piece of chicken and pounding it until it is about ¼ inch thick. This means it only needs a minute or two to cook on each side so the chicken doesn’t get dry. A simple seasoning on the meat can add to the flavour such as salt, pepper, chilli flakes, garlic, herbs or some fresh lemon juice. Another technique is an Italian method called pollo al matone where a cooking brick is used. This is where a brick is covered in aluminium foil and placed on top of the chicken while grilling. It compacts the meat to make it cook evenly, it pressed the meat to the grill to give a good grill marked finish and it helps avoid the meat drying out by keeping it covered. If you don’t have a brick you can use, a cast-iron or steel skilled with foil wrapped on the bottom can do the same job. 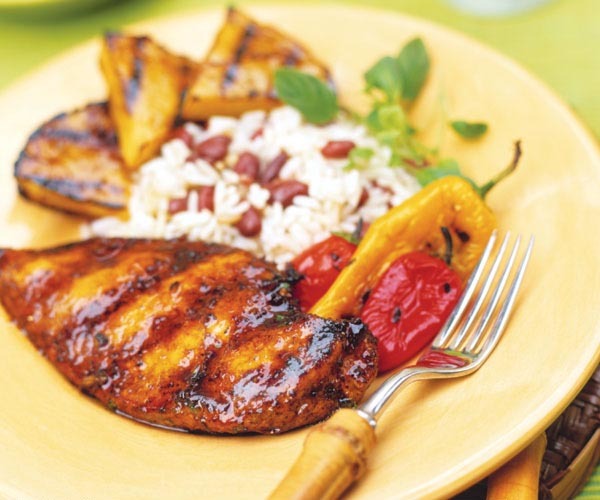 Here’s a recipe that uses both rubs and glazes called Island-Spiced Pineapple Glazed Chicken. Combine the ingredients in a bowl, cover the chicken with oil and then rub all over. Keep in the fridge for 1 hour. Combine the ingredients in a saucepan and boil for 7-10 minutes over medium heat. When you are ready to grill the chicken, cook for 2 minutes each side with the rub only then add the glaze and cook for 4-6 minutes each side. Serve with any glaze drizzled over the top.